Any organization can use Contract Assistant, which provides a centralized location to store and access contracts. Contract Assistant is affordable, feature filled contract management software that's easy to use. With Contract Assistant you can quickly access important information, generate reports, receive automatic reminders of critical dates and more. Standard, PRO and Enterprise editions are designed to help individuals, small to mid-sized businesses, and large enterprises manage all types of contracts and agreements with confidence. Request your 30 day FREE trial today! Pros: Ease of use and the flexibility the system offers is far better than any system I have ever used. Support is always there and gets a score of 12 on a scale of 1-10 in my book! Cons: It is actually hard for me to think of something I "don't like" about this system. I guess the one thing I would like to be able to change as a user, would be to replace the "Standard Report" offered on the main screen with my own report which has been customized to the needs of my team. That said, I am sure that if I turn this enhancement idea into the Support Team, they will find a way to implement the suggestion. Overall: Blueridge is the most simple contract system to use that I have ever worked with, and I've worked with most of the popular systems in the market today. It is easy to learn, easy to use, and very easy to implement yet it can scale to any size organization. It offers a significant amount of flexibility for any organization to configure and tailor the system to the business process or specific needs of the users. The system comes with a number of canned reports and users can customize reports to the need quite easily. Support is fabulous, literally the most responsive I have worked with in my 25 years of working with software suppliers. Recommendations to other buyers: I would like to commend Judy Tucker and Richard Whatley for the outstanding job they do every day. Blueridge is lucky to have such talented and helpful people in their employ! I suggest a big bonus for them both! Pros: What I like the most about this software is the speed of execution of searches, and generation of reports. Cons: There is a steep learning curve for the novice user, but the customer technical support provided by Blueridge Software helps make the learning curve smoother and more manageable. Overall: The most outstanding experience I've had from using this software is the excellent quality of support. Someone's always on the phone to assist, and the person on the other line is always highly knowledgeable of the software application, so that any technical problem that may be encountered in using the software, such as generating reports, is attended to and resolved quickly! I've never experienced better support, in all my years of database management. Recommendations to other buyers: Blueridge Software should continue to enhance and improve this software application in order to keep up with the growing needs of its clients. Contract Assistant, Standard Edition brings order from chaos! Pros: With a small department, I needed a single place to centralize all of our IT maintenance contracts that would allow me to receive enough advanced notifications to complete all of the renewal workflow authentication process. The 'Quick Start Guide' tutorial is easy to follow and the 'User's Guide' is comprehensive in describing how to use all of the package's functionality. Technical help desk support is the best that I have experienced. As an example, I ran into a small issue late on a Friday afternoon. I checked my e-mail later that evening and had received an answer to my issue and was able to continue my work with Contract Assistant over the weekend. I have also always receive follow-up calls from Bruce Tucker making sure that I received answers to my issues and asking if there is anything else that he could help me with. Cons: Contract Assistant, Standard Edition is a very comprehensive pack and you must devote adequate amount of time working with the package to understand how it functions if you want to get the full benefit of what the package has to offer. Overall: I have not found any other contract management package that fulfills the need of a small organization at such a reasonable cost. I would enthusiastically recommend Contract Assistant, Standard Edition for either a small organization needing contract management functionality or as an entry point to other organizations that could start with the entry level package and then upgrade to the more comprehensive Contract Assistant, Pro or Enterprise Edition. Blueridge Application changed my job! Pros: The application was easy to install and to administer. It is very flexable and easily configured to meet our needs. The alert features have reduced our risks of missed deadlines on contract obligations, renewals and even opportunities. The end user training required a much lower learning curve than others we looked at and it has been very easy to transfer or add licenses as people were promoted or left the company. I have found that any issues or questions I have had were immediately addressed in a friendly and professional manner - very refreshing in the world of technology. I also appreciate the fact that they work with you to find the most economical as well as efficient way to meet the needs you might have. They have been very helpful in assisting us to leverage all the features available. We originally selected the application as an inexpensive solution for the need of one department and we now have 3 seperate databases each meeting completely different needs of the Company! Cons: Any issue or question / concern I have had were resolved. The only improvement I could recommend is perhaps on some additional fields being able to open just by the double click. Overall: For the cost this is an exceptional tool. It is easy to configure and use. The automated, date driven alerts allow us to ensure the compliance and deliverables of contracts are met timely - by both our vendors and ourselves! Contract Assistant Pro gets the job done. Pros: Ease of use and administration, more than enough fields even for sophisticated contract management, easy to train others on use, low cost of entry and support. Flexible administration options. Cons: MS Access database format, limited reporting formats, GUI/layout could use improvement/customization features. Have to open the application to review alarm notifications. No email notifications. Document Check-out/check in process to limit multiple user overwrites is somewhat cumbersome. Overall: This application does as good or better job than similar applications that cost far more. It is quite easy to use, although it merits spending some time up front organizing how you will implement and design the data fields/labels that you will use/track; one can make some global changes but it's not always easy. The MS Access database format has an upside in that one can query the database using Access for additional reporting. There are no significant flaws in the implementation, although the check-out/check-in process for the various contract pages can be cumbersome when reviewing or making repetitive changes to the pages/entries. Overall I would definitely recommend CA Pro for anyone looking to get their agreement administration in once place. The Enterprise edition apparently addresses most of the cons listed, and the upcoming release of CA Pro will apparently add some 20 new features including customized reports. Service from Blueridge has been great although not much needed. Pros: I have used both the standard and Enterprise Edition of Blueridge's Contract Software. I have had a great experience with Blueridge and find them to provide personalized customer service which is so important. Depending on the size of your corporation and the volume of contracts, either of these products will be very useful. For a smaller corporation, with minimal contracts the Standard Edition may do the trick; however, Enterprise Edition is much more robust, offers more flexible search features, customization and 5 user licenses. Cons: To those not familiar with databases and report creating software such as "Crystal Reports", it can be confusing pulling the information you want; however this is something that can be immediately remedied by obtaining training that is offered by Blueridge. For me, it's just finding the time! Overall: I would highly recommend anyone wanting a more organized tracking system for a corporations contracts to implement the Enterprise Edition. Pros: I am the tech support for this product and the conversion from a pervious version and installation of version 3.7 went very well. The documentation provided is complete and when I did have questions, I called and was guided through them until I was satisfied with the answers. The product is very versatile in that my users were able to re-name many of the fields to meet their particular needs. Overall: I highly recommend Contract Assistant Pro for small contract analysis installations of 5 users or less. The customer support is outstanding. For the few times I've had to call, I have always been able to get a real, live, knowledgable, and helpful support person on the line within 1-2 minutes. I am not a user of the product, but my users are very happy with Contract Assistant Pro as it handles everything they need to track contracts, and is a very stable and bug-free program. Pros: I have been using Contract Assistant Pro Edition for several years now, and I find this software very intuitive and easy to manuever, especially when having to make numerous updates regularly. I love that I can scan my agreements and download directly to the program..certainly a 'green' feature that I appreciate. Bruce Tucker, my salesperson and software guru is absolutely the best at what he does. His knowledge of the product is unmatched, and his customer service skills are service excellence at its best. Cons: Because this section requires at least 10 characters, consider this my 10. Overall: I highly recommend this program, especially the Pro Edition for any organization looking to implement a centralized contract management system. Pros: Superb software, even better support from the Blueridge technical team. Contract Assistant has helped us finally organize and manage contracts across a seven site system of CCRC/retirement communities, including our corporate offices. The most important feature is the simplicity. This software is not a development tool, which created confusion and problems in all other programs we tested. In other words, most off-the-shelf programs try to do too much. Contract Assistant is designed as a pure management, tracking, and contract warehouse tool and it does the job very well. Cons: No downsides to the software. Overall: Very positive, I would recommend without reservation. Pros: The system despcription is true to its value, meaning it does what it says it will do. New report designer is a plus, due to being able to customization enhancement. This system helps us stay organized and meet our deadlines. Other customizable fields are a plus too. Overall, this product is a great software system to support our organization. Cons: For the price paid for the software, there are no cons that we can think of. Overall: yes, I would recommend this product to anyone who is looking to get better organized and needs assistance with meeting deadlines for vendors. 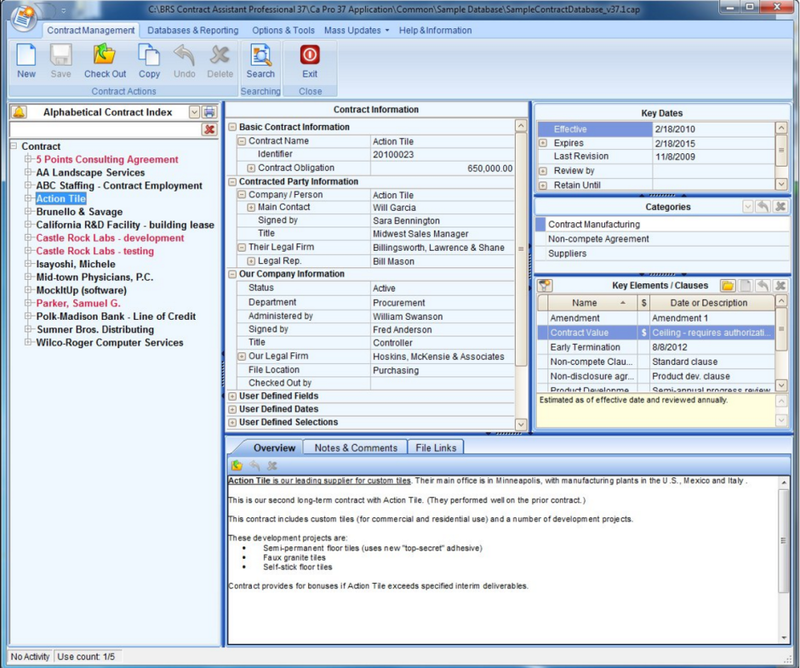 Contract Assistant is a great software! Pros: The Contract Assistant software is great. Our Legal and Compliance departments love how efficient this software is. The best part is, it's simple to use. The user guide is very easy to read and understand. This software allows us to manage our contracts the way "we" want. The customer service and technical support we receive from Blueridge is always professional and timely. Cons: We don't have anything negative to say about this product. Overall: This software is great if you are looking for something you can customize on your own to manage your contracts. Comments: Our company has been using Contract Assistant for about two years. It has proven to be the perfect software for managing our contracts. We don't write contracts - just manage them afterwards, so some of the other software products were more than we needed, more complicated and much more expensive. And, I can't say enough about support. I have found Paula to be responsive and solves any issues I have the same day, if not the same hour. Issues have related to movement of the software between platforms - I have never had an issue with the software itself. I highly recommend this product. Pros: The 2010 upgrade for our five-user license allows us to customize the data fields we want for tracking our contracts. Easy to modify the defaults to match one's preferences. Includes normal date reminders, searchable notes, and hyperlinks for opening scanned or Word files. Reporting capabilities have been strengthened, and we now also have the tailored reports we wanted. Customer service for initial setup was responsive, quick, and helpful. Overall: Highly recommended. Met our needs, attractive price. Comments: We have been using the Contract Assistant software for over two years and it has been a wonderful tool for tracking our contracts. I have found it to be very user friendly. We have actually used it to track more documents than our normal day to day contracts. We use the alarm feature to alert us when a contract is about to expire or needs renewal paperwork generated. We have a very small staff and we are constantly searching for ways to work more efficiently with less funding. The Contract Assistant certainly helps us with these efforts. I would highly recommend this product. Outstanding product and exceptional customer service! Comments: We chose Contract Assistant's Pro version as the next step from our excel spreadsheet method of managing our current and legacy contracts (approx. 2,000) and contract milestones. CA Pro was very reasonably priced, extremely customizable, very user friendly, and it does an excellent job of meeting our needs. They worked with us to build our database and then imported the data from our existing excel spreadsheet into it, which saved countless hours of data input. The customer service following the sale has been great. This product is highly recommended! Comments: My company uses this product to manage all corporate and departmental contracts. It's a great product because it fits a wide variety of contract types. It's very user friendly. It allows customizable fields, which makes it easy when terms and conditions don't apply to all types of contracts. The only con that I have is with reporting, which could simply be user error; however Customer Service is only a phone call away to assist. The system makes it easy to track effective and termination dates. The alarm feature makes it easy to never miss the expiration date! Comments: Until we purchased the Contract Administrator Pro Edition, I was using an Excel spreadsheet to log contracts. This software makes logging and tracking so much easier. I feel like I am more on my game with this software. Contract Assistant is a wonderful tool. Comments: Contract Assistant software is affordable, easy to use. The customer service support is professional, personable, and top notch! We use the system to manage at least 2,500 contracts globally. The software allows you to store, view and email your contracts in the minimal amount of time. The software allows you to set alarms for review and renew. It is a wonderful product and we would highly recommend it. It makes managing contracts almost fun. Overall: I can't say enough about the value propisition of this product. It is very affordable and delivers most of the core functionality found in big budget super-solutions. We've been using it for several years and are not looking back! Pros: The software helps to organize all contracts and stay on top of any that need attention. I would be lost without it. Most importantly, the technical support is first-rate. Overall: I highly recommend Contract Assistant to any contract administrator. Comments: We love Contract Assistant! It's feature rich and allows us to really drill down. The best thing is that we own the data, so there is never any need to trust "the cloud". Pros: Very simple to get start inputing files immediatly. Easy to follow help menu. Overall: Very efficient program. Customer support has been excellent!